Hilton marked its 100th anniversary by looking at trends and what might be ahead for hoteliers and event professional partners in the years to come. Welcome to the 4th annual Smart Woman Summit! 2019’s power career conference hits Las Vegas on May 7-8 to celebrate all women in meetings. Do you have a favorite property, venue or destination that helped make your event a smashing success? Cast your vote for the 2019 Smart Stars Awards! From the bright lights of Dallas, quirky music stages of Austin and scenic beauty of The Woodlands, Texas just may be your next best meeting destination. 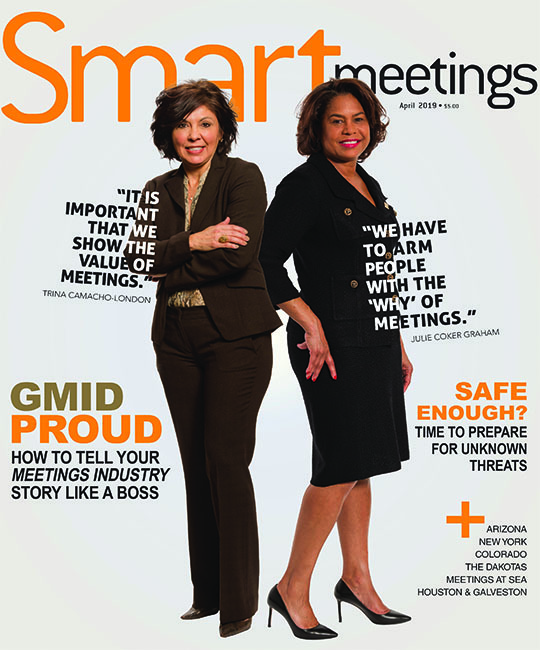 Smart Meetings is dedicated to curating a community of strong, talented women. Show your support for your colleagues and submit your nominations today. From shielding yourself from data breaches to protecting your attendees in an emergency, here are the apps, tips and checklists that will keep you safe. Are you struggling to connect with co-workers, clients or attendees at your events? A new book by Brene Brown lays out the secret to getting what we want. Some of the best, most promising sales and marketing leads often come from the attendees of your company’s in-person events, as event-qualified leads.